Earlier in the year, I set out to paint my blue hydrangea in both watercolour and also in acrylics. Amethyst Blues is the acrylic version. And it is seemingly taking forever. Painting the same image twice?? What on earth was I thinking??? This is a rather large painting 30"x30" and I have finally spanned the paint to both side edges. This feels like quite the accomplishment. Now, not all the petals in that span are complete but they do have colour on them. It's interesting, but I find working with acrylic paint more challenging than watercolour. I can't explain it. But I find acrylic can be stressful. The good news? It is really starting to take shape. And another observation? No matter what medium I work in it is recognizable as my style. I think it is all about the detail work and colour intensity. I always have more than one painting on the go. Because I love the effect of the pouring process, I have been trying to work out in my head how to replicate or emulate the poured painting process that I use in watercolour in acrylics. I thought about this at great length. I even dreamt about it. And then i decided to go in. After the first pour. I thought this is pretty ridiculous. Why not just paint it? I set it aside and thought what can I lose with one more pour. Somewhat determined I went through another painstaking masking application. When I started to pour the next layer, well it started to lift and run. You see the first layer of paint was applied pretty thin. With acrylics if the paint is not applied thick enough on the base layer it will lift. Crap. So I let it dry. Then I decided to apply the paint with a big brush. Better. But I came back to my original thought...just paint it. Forget about the masking compound. I removed the masking compound - some of the paint came off with it. I like that you can see it is the gates at the entrance to the Loyalist Burial Ground in the winter. I think I "see" this subject as a rich, juicy oil painting. Not a washed out acrylic. I think the universe was trying to tell me something. The very first article I read today was "5 unusual habits to keep you growing artistically" by Christopher Gallego. Really good read suggesting things like "Paint some crap" and "do the impossible" such as paint huge and get out of your comfort zone. Pretty much checked off a few of the boxes with this experiment. Happy I tried. I will be gessoing over this one soon and will have a pristine new blank canvas! The interesting thing about summer is when the sun is out, I am out. It is not possible for me to stay indoors and so work in the studio s-l-o-w-s down and is often neglected. Such is the case with Amethyst Blues. This painting has been on the easel for far too long. This morning it talked to me and I dove in. I find that when I am working in acrylic, I really need an extended period of time to paint. Waste not want not (paint I mean). Summer is often fickle and this year, we have been starved for heat and sunshine. So when Mr. Golden Sun is shining I am so stir crazy that I have to go out. The summer factor really digs into my studio time. Ah, the choices we have to make. Watercolours allow you to grab an hour or two whenever you feel like it. Acrylic not so much. Time has to be scheduled and planned. One of of my favourite memories as a little girl was waking up from a nap with the warmth of sun shining on me and the sensation of the cooling breeze flowing in. The curtain would be dancing in the breeze and I literally thought it was heaven. The scent of the salt air The memory of this is still heaven to me. We were still living in Cape Breton. Our little house was close to the shore. I was laying on my bed. Just awaking from my nap. It was sunny and warm outside. My window was wide open and the breeze was blowing my light curtain across my bed. I felt so safe and so content as I lie there basking in the sensation and scent. Confession, I tried to take as many naps as possible this trip. And a wonderful family reunion! Note: the person jumping is a stranger -I just love the freedom of the moment. The first real sign of spring and I want to break free and escape the indoors. Uh oh methinks my goal of completing this painting before I leave for San DIego in less than two weeks just got seriously challenged! Seriously, if the sun is out then I am out! I have to admit that I am loving working on this painting. I love working with these tender shades of blue. Please understand from my perspective blues can be tricky. If you are not careful it can give the appearance of plastic or be garish. Really have to keep the touch light with the paint and apply with in layers. The image above really does not show you the scale of this painting. It is a full sheet watercolour - 22"x30" unframed! The acrylic version peeking out from underneath is 30"x30". I am so excited to see them completed and beside each other - for no other reason than just because. I love sharing little corners of paintings that excite me - pretty much any new space I am working on. I really think that working with so many shade of blue is invigorating. I know why...it is because we have not seen any blue in the sky for so long....long, damp, dark spring! Finally finished. This is a mixed water media piece on Arches 300lb cold pressed paper. I have never combined acrylic and watercolor previously. So, I have learned a lot from this process - get over yourself - use a masking solution. I started with the sky - four watercolor washes and three in acrylic. The incredibly stubborn part of me resits masking. So I started with the sky, painting around the flowers - big mistake. 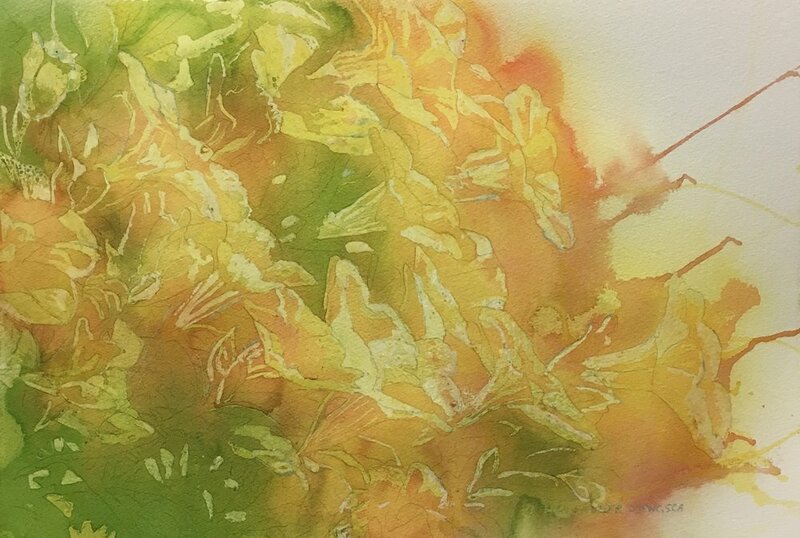 This left a dark ridge around the flowers - several washes later, hmmm... I had a problem to fix. I subscribe to the theory that is isn't anything you cannot fix. So, I pulled out my acrylic tube of cobalt blue- mixed it with the watercolor paint I was using and it worked - only took three washes to fix it! Did I mention that I am stubborn with this stuff? Anyway, I love the result! On to more experimentation! Since the beginning of this past summer, every morning (or so) I would go out onto our deck and admire the amazing shades of blue in our morning glory vine. As summer progressed and the vines reached the top of the arbor, the shade of changed to a more intense shade of blue. Several mornings in a row, I would rush outside with my camera to photograph the back lit blooms. I was afraid it would rain soon and beat the blooms into oblivion. As summer started to wane, the intensity of blue in the morning sky also deepened. This is when I realized this little morning obsession I have would have to become a painting. I was torn – to paint this in watercolour or in acrylic. Watercolour being my favourite medium, I drew the blooms out on Arches 300lb cold pressed paper. As I began painting, my strategy had to change. I started with the sky. With my normal approach, not using a mask (mistake in this case) I started to paint the sky, ever so carefully painting around the blooms. Three washes later I still had streaks. This is where the masking medium would have been my friend. Hmm, what to do? I decided this would be a missed media piece and layered on two more washes, same colours but in acrylic with a tiny touch of white added to help blend out the uneven tones I inadvertently created around the blooms. This approach worked. This is now officially a mixed water media piece. I love the contract and the way the painting is building. I do believe I will repaint this piece – larger and in acrylic. In due time. And maybe next summer!